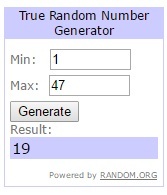 Now, first off for this week, we need to pick a winner for the Flying Geese Assignment. And great job to everyone on their gaggle of geese!!! It is so much fun to be quilting-a-long with you all!!! The Flying Geese assignment winner who gets a Volume II Jelly Roll by Sweetwater for Moda from Lou Lou's Fabric Shop is . . .
For a 24" Block - 4" x 4"
For a 28" Block - 4 1/2" x 4 1/2"
For a 32" Block - 5" x 5"
For a 40" Block - 6" x 6"
So just to help clarify . . . if you are doing the 2 x 2 the 3 x 3, or the 4 x 4 layout, you should have 12 squares of each of your print fabrics. So the 2 x 2 layout, 12 squares each of 4 different fabrics for a total of 48 print squares and 48 background squares. For the 3 x 3 layout, 12 squares each of 9 different fabrics for a total of 108 print squares and 108 background squares. And for a 4 x 4 layout, you should have 12 squares each of 16 different fabrics for a total of 192 print squares and 192 background squares. And if you are doing the 1 x 1 layout You should have 8 squares of your "Corner" print fabric and 4 squares of your "Surround" print fabric. You will have a total of 12 squares in 2 different prints and 12 background squares as well. So has everyone found their squares?? Excellent, let's make some Half Square Triangles!!! Start by using a ruler to draw a diagonal line on the wrong side of all of your print fabrics (or if your background fabric is darker than your print fabrics, draw the line on those instead ;) I like to draw my lines with a Frixion Pen as the lines will disappear with heat. And depending on your machine set-up . . . you might be able to skip drawing the lines all together. If you have a table around your machine, or if your machine comes with a large "table" you can extend your machines 1/4" mark with tape and then use that as a guide instead of having to draw a line. There is a great You Tube Video from Fat Quarter Shop on how to mark your machines 1/4" line, I just don't bother to layer the tape as I am just using it for a reference, so just one layer. Or, I recently discovered the Clearly Perfect Angle , which has both the 1/4" Mark and the Center Mark (for stitch and flip) marked. I have quickly become a huge fan of this as it eliminates a whole ton of drawing lines!!! Now, with the stitching done, it's time to do some more cutting. Align your ruler along the drawn center line (or from corner to corner) Cut along the edge of your ruler, creating two triangles that each have a 1/4" seam along the long side. I am making 28" blocks so this trimming example will have raw 4 1/2" HST's that are being trimmed to 4" square. So lets start ;) Begin by aligning the 45 degree line on your square ruler with the seam line on your half square triangle. Make sure that the raw edges of the half square triangle are over the 4" line's on your ruler. Trim the 2 sides along the edge of the ruler. There won't be a whole lot to trim. Now spin your half square triangle unit 180 degrees. Once again, align the 45 degree line on your ruler with the seam line on your half square triangle. Align the raw edges of the half square triangle under the ruler on the 4" lines on your ruler. Trim the 2 sides along the edge of the ruler. And you have perfectly square Half Square Triangles. They are just so pretty! And I know, it seems like a lot of work to just trim off a little, but having perfect HST's allows you to have awesome pretty points and really makes the piecing of the block easier ;) I promise, it will totally be worth it! And that is how it is done!!! A pile of 24 HST's for each block in your project. Now, I want to throw in a quick note here. I know just how much trimming this is, a ton!!! Especially if you are doing the 3 x 3 or 4 x 4 layouts. So if your piles for linking look a little like this (aka not trimmed) that is totally okay. You can continue to trim over the coming weeks spreading the job out a bit. Don't go making your hand unusable for 5 days because you trimmed all at once. And please link up your untrimmed blocks if you cant finish your trimming. Linked untrimmed piles are just as perfect as linked trimmed piles. 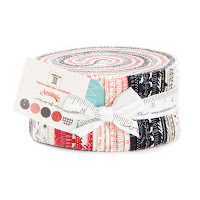 The Weekly Prize is sponsored by The Scarlet Thread Quilt Co. and a huge thanks goes out to them for their support of the Summer Solstice Quilt-A-Long. 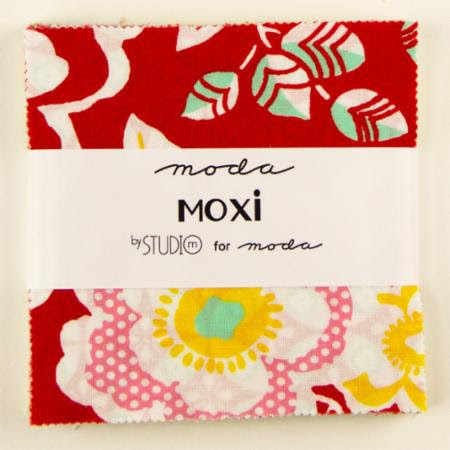 This weeks prize is for a super adorable Moxi Charm Pack by Studio M for Moda. Don't you just love charm packs, they are so much fun and these prints are just so happy!!! So let's get sewing and trimming some Half Square Triangles ;) Oh, and if you have questions, don't hesitate to email me at happyquiltingmelissa@gmail.com. Have a Happy Quilting Day!! I'm a little behind...I had to find matching/complimentary background fabric because I didn't have enough! I've cut my backgrounds and marked lines for HST and Cut and marked for FG. Just gotta finish cutting DP/HST prints! I'm a little behind too and need to get my rear in gear. Other deadlines got in the way. The instructions are great Melissa!